Can bisphosphonates play a role in the treatment of children with chronic kidney disease? In patients with chronic kidney disease (CKD) renal osteodystrophy, in the form of either low- or high-turnover bone disease, is quite common. While renal transplantation is expected to reverse renal osteodystrophy, long-term treatment with glucocorticoids before and/or after transplantation may lead to osteoporosis instead. Osteoporosis is defined as a skeletal disease with low bone mineral density, microarchitectural deterioration, and concomitant fragility. In adults, bisphosphonates are widely used to treat osteoporosis and other diseases associated with excessive bone resorption. 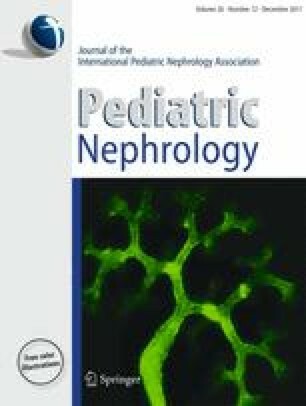 In pediatric CKD patients the efficacy and safety of these drugs have not yet been addressed adequately and thus no evidence-based recommendations regarding the optimal type of bisphosphonate, dosage, or duration of therapy are available. Furthermore, while in adults the determination of areal bone mineral density is sufficient to diagnose osteoporosis, this is not the case in children. Instead, in pediatric patients, careful morphological assessment of bone structure and formation is required. Indeed, data from studies with uremic rats indicated that bisphosphonates, via a deceleration of bone turnover, have the potential not only to aggravate pre-existing adynamic bone disease, but also to impair longitudinal growth. Thus, the widespread use of bisphosphonates in children with CKD should be discouraged until the risks and benefits have been carefully elucidated in clinical trials.